In addition to grants and products, corporations also encourage philanthropy and support employee giving. As a program of Partnership With Native Americans, AIEF participates in workplace giving programs such as the Combined Federal Campaign* (CFC) and the State Employee Campaign (SEC), and we can establish a workplace giving campaign just for your company. Employers that are looking for a charity to adopt or a project that involves their staff in corporate social responsibility (CSR) often find an untapped interest related to Native Americans. Find out whether your employer has a matching gift program to boost the impact of your personal giving. See if they participate in the CFC or SEC in your state or whether you can organize an employee giving campaign. Ask whether they’re looking for a charity to adopt or projects to sponsor, and whether they give employees time off to volunteer or conduct a drive for something like school supplies. TOMS, for instance, gives shoes for thousands of Native American children each year. If you’re thinking about organizing a drive, we can always provide you with insights on high-need products for the reservations. Call our Donor Relations Department toll-free at (800) 881-8694 for assistance. Or, you can submit a form online for someone to contact you. Many companies have matching gift programs set up to encourage their employees to donate to charities. If your company has a matching gift program, you can double or even triple your donation. If you have any questions, our Donor Relations Department will be happy to assist you with your company's Matching Gift program. Please contact Donor Relations at (800) 881-8694. 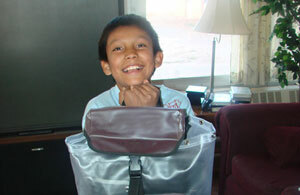 Your gift helps provide vital services such as the School Supplies service.